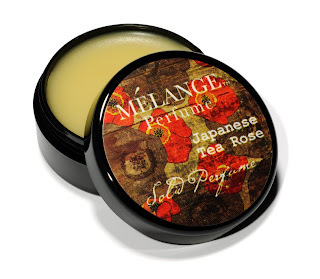 The studio is alive with the fragrance of Japanese Tea Rose and Sakura Blossom. We are hard at work on our new Solid Perfume singles. Each fragrance takes on a special meaning for me. I have always loved our Japanese Tea Rose. It has a wonderful, fresh green top note that is unlike most Rose notes I encounter. When I first tried our Sakura Blossom (also known as Cherry Blossom) I was intrigued. It had a definite fruit body but possessed this lovely floral attribute that was unique from any fruit note we used before. I learned that in Japan many people celebrate the bloom of the Cherry trees by celebrating the Hanami, a gathering of friends and family under the trees to take in their gorgeous fragrance and admire their beauty. The two notes balance one another so beautifully and are so blendable - I am wearing the Japanese Tea Rose with our Cedar, Musk & Patchouli today. Happy Saturday!